(January 28, 2015, The Condor: Ornithological Applications)—Fluctuations in the population of Glaucous-winged Gulls (Larus glaucescens) in British Columbia’s Georgia Basin reflect a series of ecological changes over the course of the twentieth century, as demonstrated in a new paper in The Condor: Ornithological Applications. Louise Blight, Mark Drever, and Peter Arcese of the University of British Columbia collected all available population counts of gulls in the basin from 1900 to 2010 and created a demographic model that revealed major changes in the gulls’ population over the decades in response to elimination of egg harvesting, recovery of Bald Eagles after the banning of DDT, and changes in food availability. Starting from a low point at the turn of the twentieth century, gull population counts increased over the following decades and peaked in the 1980s before beginning to decline again. The harvesting of eggs had seriously depleted gull numbers before being banned by the Migratory Bird Treaty of 1916, with naturalists of the time describing Georgia Basin islands as “systematically robbed” and “clean of eggs.” In the decades following the treaty, the population was able to recover, increasingly rapidly over the following seventy years. In the 1980s, however, greater numbers of Bald Eagles (a gull predator) and the decreasing abundance of fish in the area caused gull populations to drop again, ultimately decreasing to about 50% of peak levels by 2010. Because gulls sit in the middle of the food chain and will eat almost anything, they can be an important indicator of what’s going on in the broader ecosystem. “As generalists they should be able to buffer a relatively high degree of food web change. If, despite that, they are experiencing a population decline, they may be telling us that there have been some fairly profound changes to local marine ecosystems,” says Blight. 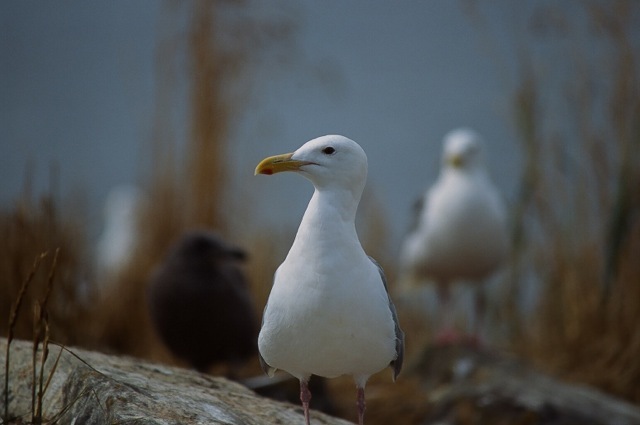 For over a century, humans have been shaping the population dynamics of British Columbia’s Glaucous-winged Gulls, and over a hundred years of environmental history are encapsulated in their ups and downs. A century of change in Glaucous-winged Gull (Larus glaucescens) populations in a dynamic coastal environment is an open-access article that can be viewed at http://www.aoucospubs.org/doi/full/10.1650/CONDOR-14-113.1. Contact: Louise Blight, lkblight@interchange.ubc.ca. About the journal: The Condor: Ornithological Applications is a peer-reviewed, international journal of ornithology. The journal began in 1899 as the journal of the Cooper Ornithological Club, a group of ornithologists in California that became the Cooper Ornithological Society.